You are here: Home / Watch a wonderful book trailer for witty wordless picture book Caged! Caged will be launching August 24th! Watch a wonderful book trailer for the newest addition to our Wordless Picture Book series, Caged. 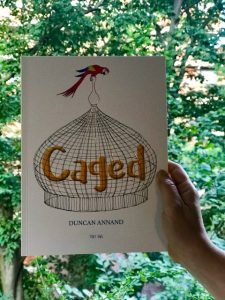 A witty tale of freedom, this is Duncan Annand’s debut picture book. When a bluebird makes her nest near two eccentric gentlemen, she sees their cruel and ambitious plan to create an enormous birdcage. As she builds her nest, the men’s construction goes up, and more and more birds are trapped. Until, one day, the bluebird sees a wonderful opportunity to give the men a taste of their own medicine! Enjoy the video, and don’t forget to share your thoughts and comments with us! Caged is launching Edinburgh International Book Festival! Buy tickets here! Meet the mind behind Caged! Watch an interview with creator Duncan Annand! The highlights of our Wordless Picture Book campaign!